Chicago Shakespeare Theater produces Shakespeare and other classical works, musicals and new plays, and plays host to a multitude of visiting artists from around the world. The Yard is getting attention for its unique design. The venue is now one of the most flexible theatres in the world, allowing the artists to shape the space into whatever they need for the current production. The space has a whopping nine audience seating towers—each the size of a London double-decker bus, stood upright—which can be arranged in a variety of shapes and sizes, seating audience capacities from 150-850. Whether the production calls for a small and intimate space or a full-scale spectacle, The Yard can accommodate. 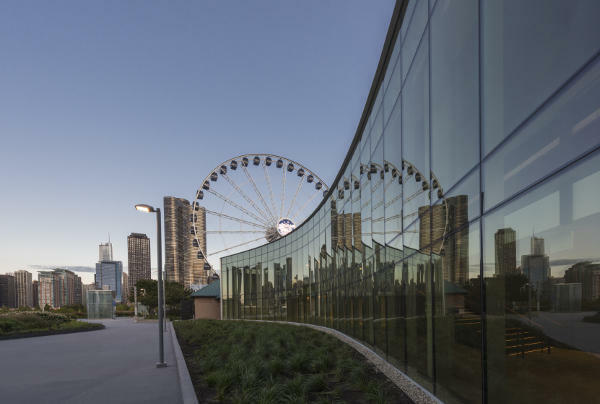 The innovative design includes repurposed elements from the former Skyline Stage on Navy Pier, making the construction more economical and environmentally sustainable. Now the big white tent houses a fully enclosed, 33,000 square-foot space that connects through a stunning glass lobby to Chicago Shakespeare&apos;s existing building. Construction on The Yard began in March 2016, and was completed in 18 months by Bulley & Andrews. More than 200 architects, engineers and designers, and 400 construction workers contributed to the complex build, which incorporated 2,500 tons of concrete, 375 tons of steel and 15 miles of electrical conduit. 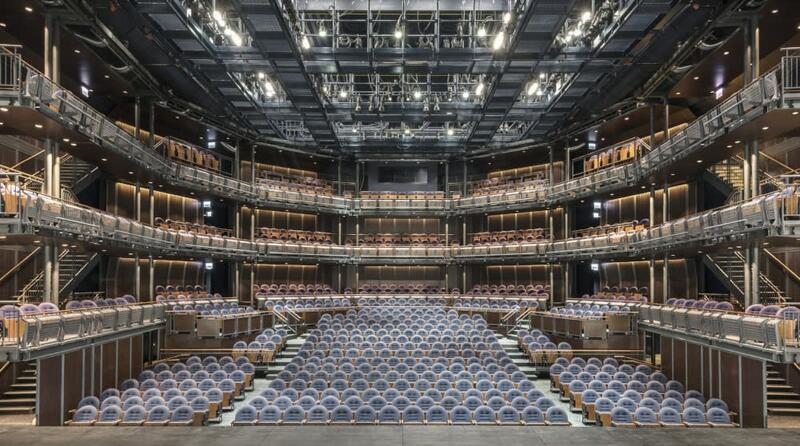 "The Yard is forward-thinking and responsive--and a fitting expression of the theater that Chicago Shakespeare has become," said Criss Henderson, Chicago Shakespeare Executive Director. "The versatility of the space means that it is perfectly suited to the widest range of our work: from large-scale musicals and new commissioned works, to international imports and programs for young audiences, and, of course, bold imaginings of Shakespeare&apos;s plays and the classics." Collaborating with CST Executive Director Criss Henderson, the design team includes: Chicago-based firm Adrian Smith + Gordon Gill Architecture (AS+GG), winner of the 2015 American Architecture award and designers of the Jeddah Tower in Saudi Arabia (soon-to-be the tallest building in the world) along with award-winning, UK-based theater consultancy firm Charcoalblue, whose projects include venues for the Royal Shakespeare Company. Highlighting the versatility of the new venue, each production in The Yard&apos;s 2017/18 Season will feature a unique configuration that is specifically suited to the needs of the artists and audiences. The first two productions this fall include The Toad Knew and Amarillo. 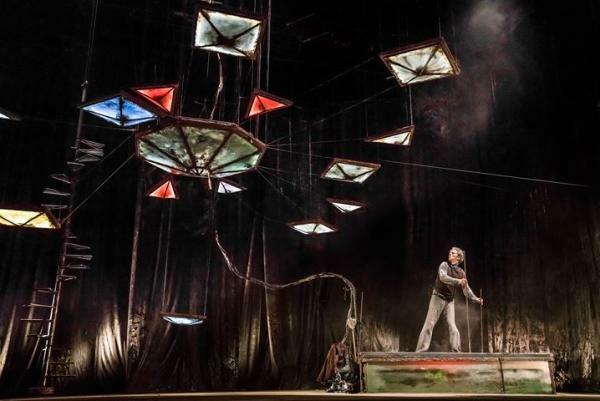 James Thierrée&apos;s The Toad Knew will debut The Yard&apos;s largest proscenium configuration. The nine tri-level seating towers will be configured in a horseshoe shape, the audience will accommodate nearly 850 people, offering ideal sight lines for the large-scale theatrical spectacle. The Toad Knew runs September 19-23, 2017. For Teatro Línea de Sombra&apos;s Amarillo from Mexico City, The Yard will be configured as an intimate proscenium venue seating 350 theatre-goers, with its large stage accommodating the epic theatrical gestures of this touring production, including an expansive upstage wall for projection. Amarillo runs October 17-29, 2017.